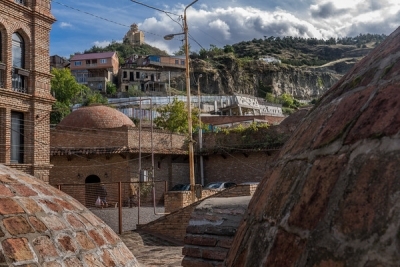 Tbilisi Historic District is part of the Tentative list of Georgia in order to qualify for inclusion in the World Heritage List. The Tbilisi Historic District is part of the Tentative list of Georgia. It’s a small neighbourhood in Georgia’s capital that can be explored on foot. The rest of the city is of course much bigger: over a million people live there and one moves around the easiest with the subway that still dates from Soviet times. I went several times to Didube metro station for example, to take buses to Mtskheta and Gori from the eponymous bus station. A ticket costs a mere 0.5 lari (0,17 EUR). I first explored the Historic District by the 3-hour 'free' walking tour of Tiblisi Hack Free Tours. This was under the guidance of Russian(!) Anya and together with about 15 other tourists from all corners of the world: Lithuania, Ukraine, Germany, Canada, United States, Jordan. Her key question was "Do you think Tbilisi is more Asian or more European?" This befits one of the two key elements in Tbilisi’s claim to OUV: the location of Georgia (and especially Tbilisi) on the cross-roads of Europe and Asia with all consequent historical conditions. I think the Historic District is more oriental, to a certain extent it resembles Istanbul or Sarajevo. The traditional sulphur bath houses and their domes also contribute to that image. The Historic District also has many dilapidated and vacant houses. These were abandoned by their owners in the 80’s and 90’s, when the economic situation in Georgia was very bad. There are no clear plans what to do with them. It has made the area especially attractive for artistically minded photographers. The other claim for OUV is: “always multi-national, free and tolerant in the respect of religious confession”. 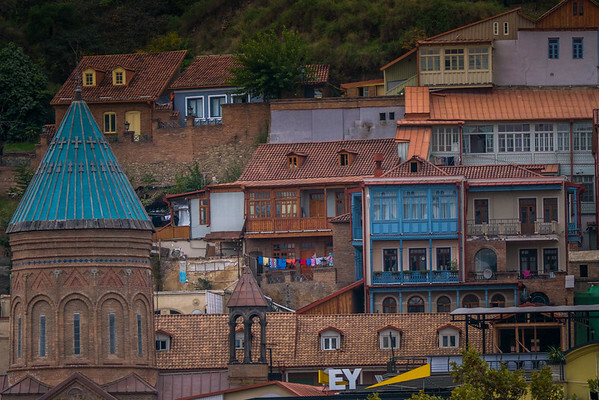 Church visits in general are a main pastime for tourists in Georgia anyway, and the Historic District of Tbilisi is one big mix of religious expressions. We had a look at the interior of an austere Catholic church, walked past 2 synagogues and a mosque, and visited 2 Georgian Orthodox churches. One of the latter (Sioni Cathedral) is home to 'Saint Nino's Cross' - an important relic of the original wooden cross that Saint Nino made on her way to Mtskheta. It was homemade, of two tree branches tied together with her hair - hence the peculiar drooping horizontal arms of the Georgian cross. Also typical for Tbilisi are the many stray dogs. They lie down on the pavement, or are out with friends. They usually look in pretty good condition, they are fed by local people. Many also wear a yellow label in their ear: a sign that they have been vaccinated against rabies. On foot you are not bothered by them, but I saw them chasing cyclists a few times. Outside of the Historic District, the main boulevard Rustaveli Avenue is also worth visiting. This is the street with all the Important Buildings. It includes the Opera, the Theatre, the National Museum, the former Parliament and the Academy of Sciences. At this street the Soviet era, which lasted for Georgia from 1921-1991, is still the most touchable. The National Museum is unmissable: the absolute highlight is in the basement, in the Treasury. Here hundreds of small gold objects from Colchis are exhibited. Colchis was the name under which this region in Classical Antiquity was known for its gold mining. The objects are up to 6000 years old. Absolutely one of the most charming cities in the world, I would recommend Tibili's Old Town to any traveler looking for inspiration that might reignite the travel spark. The Republic of Georgia itself is fascinating and my favorite places in the lower Caucasus region — the food, wine, architecture, history, and culture are completely unique in the world. For the Historic District itself, the best way to explore is on foot and with a camera in hand. The aesthetic is just gorgeous, with lattice-worked balconies sighing from colorful buildings. It's a fading glory though, and you can feel some of the Soviet-era destruction and just lack of ability to maintain. In that way, Tbilisi reminded me a lot of Havana, Cuba — it's so pretty, but some of that comas as a decaying beauty that is the priced the city (and residents) paid for living through history. 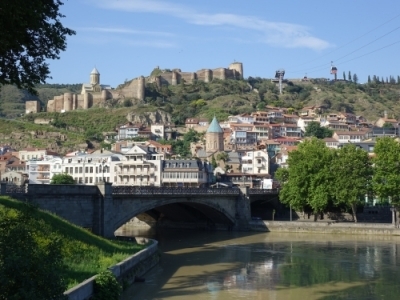 The impressive Narikala fortress and Mother Georgia statue rise above the Historic District, which are also completely explorable and enjoyable. I've visited quite a few other UNESCO cities, including Antigua, Guatemala; Luang Prabang, Laos; and Hoi An, Vietnam — this one ranks high on this impressive list of cities. Perhaps even more enjoyable, however, are some of the more intangible aspects of traveling in the Republic of Georgia. The hospitality, the beautiful polyphonic signing (also UNESCO), the long history of wine (and the drinking of it that is quite present in current culture). Then, the city also makes for a great day trip out to other cities filled with historic monasteries, ruins, and more. When you visit Tbilisi, you can absolutely feel the history and understand why this charming city is a UNESCO World Heritage Site. I loved it even though it is not very well maintained. In its time of glory it had to be splendid.